From the Middle East, land of bible history, comes an array of over 250 recipes from Kibby to Baklawa. This is an authentic collection of Syrian and Lebanese dishes which have been handed down from mother to daughter for generations. Helen Corey learned these recipes from her mother, a native of a Damascus suburb. Her testimony to the health values of these foods is a tribute to her mother who lived an active healthy life to the age of 107. Helen continues to follow in her footsteps, planting her own garden and herbs stemming back to the days when their home was the focal point of all Middle Eastern visitors who sat at picnic benches under their grape arbor as they feasted on Tabooley while plucking the tender grape vine leaves to use as scoops. One has only to read these pages to learn that Helen was brought up in an environment where the family extended themselves to their age-old proverb "God fed you - Eat and Feed". More than just a cookbook, one will learn a great deal about the people of the Middle East through their customs and cultures. Corey gives you traditions that exist here today as they did in the land of her ancestors as she offers a familiar welcome phrase to all her guests of "ahlan wa sahlan". 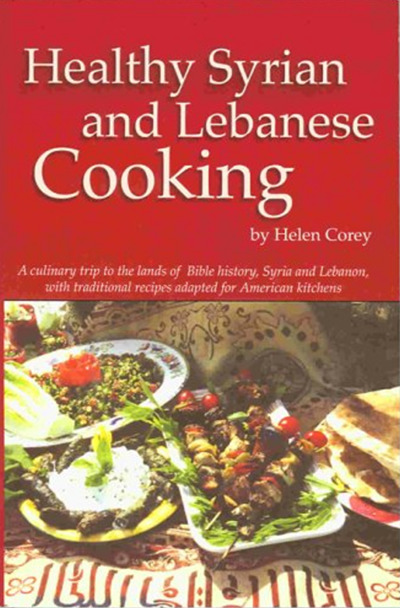 Many photographs, a glossary of Arabic terms, a discussion of herbs and spices, and complete Arabic and English recipe indexes add greatly to the value and usefulness of this newest volume of Helen 's outstanding cookbooks.